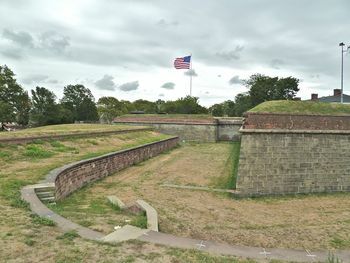 Fort Jay (1794-1966) - First established in 1794 as a First System Fort. Named after John Jay, U.S. Supreme Court Chief Justice, U.S. Secretary of Foreign Affairs and New York Governor. Rebuilt and renamed in 1806 as Fort Columbus, renamed back to Fort Jay in 1904. The U.S. Army left Governors Island and turned the fort over to the U.S. Coast Guard in 1966. The first Fort Jay was a First System earthen star fort with two detached batteries. This first fort was modified, then completely rebuilt in 1798-1801, and then demolished in 1806 in favor of a completely new fort. The new Second System fort was completed in 1808 and named Fort Columbus, it was a large masonry pentagon with four bastions and ravelin. The new fort was designed to hold up to 100 guns. In the 1830s four brick barracks were built on the quadrangle inside the fort walls. During the U.S. Civil War fifty 10" and 15" Rodman cannons were emplaced to protect the harbor. The north barracks were used to hold Confederate officer POWs in transit to other Union POW camps. 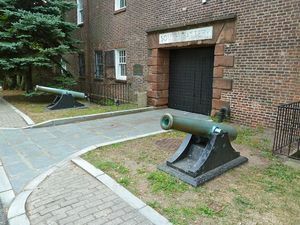 The old fort and the new surrounding post was renamed back to Fort Jay in 1904 by Secretary of War, Elihu Root who also ordered the expansion of Governors Island using fill from the construction of the New York subway system. During WWII the post was the headquarters of the Eastern Defense Command. The first major scrap drive of World War II claimed most of the remaining U.S. Civil War Rodman cannons. Three 10" and one 15" Rodman cannons were retained at the fort for historic display. Governors Island National Monument, Governors Island, New York County, New York. 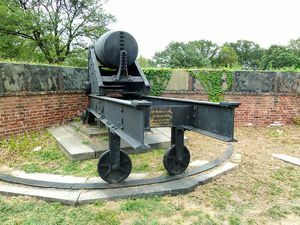 Mounted period cannons. Must see! 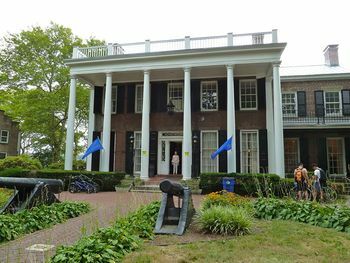 Location: Governors Island, New York County, New York. Speer, Lonnie R., Portals to Hell:Military Prisons of the Civil War, Stackpole Books, 1997, Mechanicsburg, PA, ISBN 0-8117-0334-7, 410 pages, page 325. This page was last modified 10:18, 16 April 2019 by John Stanton. Based on work by Bill Thayer.